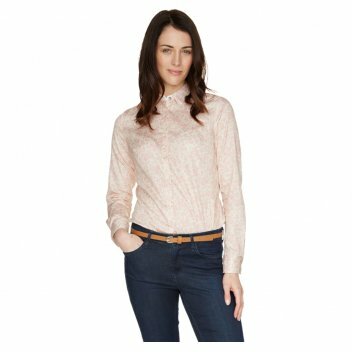 This elegant shirt in cotton satin looks fantastic worn under a soft jumper or tank top. We love the pretty patterns created by Julie Dodsworth exclusively for Barbour. The prettiness is further emphasised by pearlised buttons and a roase shank button on the collar. Available in three colourways/patterns; The Fledgling, Kissing Gate and Garter Blue. Back length: 66.5cm-70cm / 26"-27.5"
Shirt is lovely pattern but material rather thin and buttons down front stop too soon such that I worry about flashing my flabby stomach at unsuspecting onlookers.\n\nRealise this is probably more a Spring/Summer rather than an Autumn/Winter shirt. Apart from that pleased with my purchase.